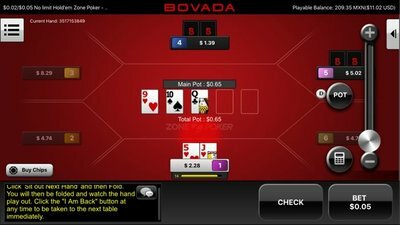 Real-money mobile poker players in the United States and most Latin American countries can now play a speed poker and ring games on any Android or iOS smartphone or tablet at the popular Bovada online poker room. Play from anywhere in the U.S and Latin America. Play ring games instantly from any Android or iPhone. Part of the PaiWangLuo network with Bodog & Ignition . Texas Hold’em, Omaha and Omaha Hi/Lo cash games. Poker Tournaments and Fast paced Zone Poker. There are zero cashier charges if you opt to use Bitcoin. 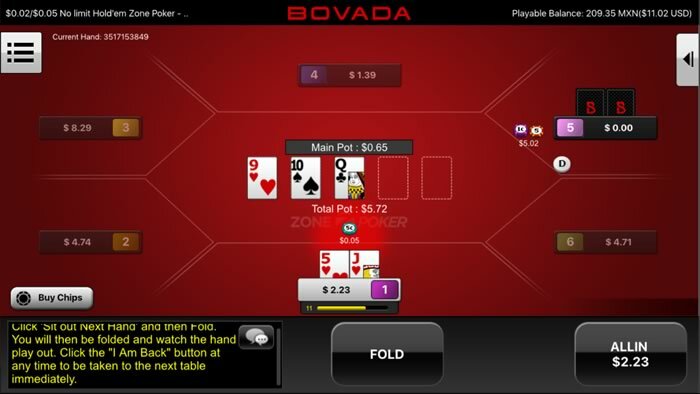 Bovada are back after a year’s hiatus from the poker industry and this time they are on course to crack the mobile poker sector with their all-new Android app. The company, now owned by PaiWangLuo, formerly a part of Bodog, have been working hard behind the scenes to bring the brand into the 21st Century. The network is currently the second largest in the US, which speaks volumes given that Bovada have been out of it for the past 12 months. Whilst not necessarily renowned for their reliability, the network has been able to accumulate a massive player database and we think about as good as you are going to find for US-based players. Bovada now accepts both Bitcoin (BTC) and Bitcoin Cash (BCH), in addition to all major credit and debit cards. The welcome offer from Bovada is one of the best in the business. It’s worth up to $500 and is a 100% match on your opening deposit. The reason we speak so highly of it is that we think it caters to all bankroll and player limits, in that you can work through as much or as little of your bonus, with it getting released in several increments. The bonus will be credited to your account as you accumulate poker points earned from real money poker games. The process is pretty simple in that you earn 1 point for ever $3 spent in rake, which includes both tournament fees and cash games. As you reach certain brackets of points you will then be credit with part of your bonus. For example, 15 points gets you £5 worth of bonus, 85 gets you $15 worth of bonus and so on. It’s worth noting that you get just 30 days to clear the full bonus amount before any remaining bonus expires. To access the app for Android you first need to enter the website via your smartphones mobile browser. There is no official download from the Google Play store, instead you need to simply add to your home screen, which you are prompted to do when you land on it. Once in, it does function like an ‘app’ though and it’s not based within your browser which is good. Whilst you can play from your browser, we don’t recommend it as it doesn’t quite render properly. You get to access to pretty much all the functions and features that you find from the desktop version, which includes things like being able to change the table colour, card colour, information on screen and dozens of settings. We really liked the functionality of it all and you were able to easily make it unique to how you want to view it and what you want to see from the table. For those that have access to the iOS version, it’s pretty much the same to be honest! Bovada have always been one for cramming lots of features into their games and playability, with the Android app being no different. A couple of standout features for us included the hand strength signifier, which for beginners is great and also the fold and show, which allows you to crush the soul of your opponent when you’ve run a three-street bluff against them. The tables also allow you play totally anonymous, which is a feature that we think makes Bovada stand out from the crowd. This often means that regular players are less likely to play the games as it’s tougher to get reads and the lack of any HUD compatibility enforces this again. In turn, this makes the games a lot more user friendly for the ‘everyday’ poker player. The games are full of regulars and it allows recreational players to be able to enjoy the games more without their flaws being exposed by more experienced players. But, we will say that the games aren’t as soft as many reviews would have you think. We’ve seen that they can vary quite dramatically and obviously as you move up stakes, the standard does rise. Having said that, we will say that they are better than most and if you are a fairly competent player then it’s likely you are going to do pretty well. 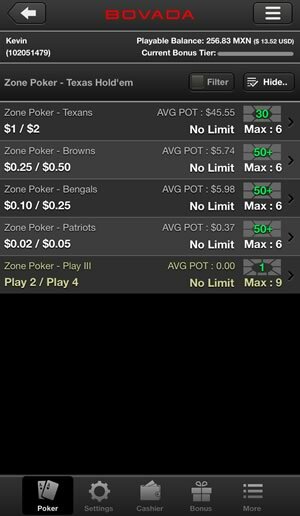 The Android App allows you to access two game types; Zone Poker and Cash games. The Zone Poker format is the fast paced, Rush-type games, which essentially allow you to move tables and play the next hand almost immediately. You play within a pool of players, which makes it tough to get reads but, can be extremely addictive due to the speed of the games. The cash games will include Texas Hold’em, Omaha and Omaha Hi/Lo. The Omaha games in particular are really soft and we think that this is where the value lies with Bovada. Even relatively moderate players are likely to do well here, but we did struggle to find a huge number of games from 50PLO upwards. Overall, the game types and stakes were pretty good. 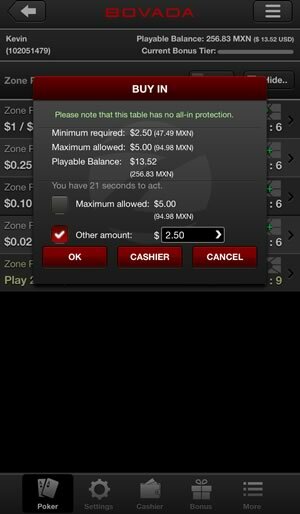 Low limit players could access games from 2c/5c and the higher limits were around the $10/$20 for Texas Hold’em. Again, higher limit games do struggle for traffic though, so you may need to sit and wait it out. A little tip for this would be to turn auto lock off your phone, as once it locks the app will restart and you will have been removed from your table. Following a recent update, mobile poker players can now play Multi-Table Tournaments and Sit N Go tournaments via the Bovada app. First off, it’s great to see Bovada back and it’s great to see them offering such a strong range of games for Android users. There is little not to like about the app to be honest and we think that for US punters especially, they are the best by far of a pretty average bunch on mobile. The recent addition of tournaments to the app means it is one of the best options for real money poker players in the United States.